From the ground crew that checks the airworthiness of your plane to the pilot who flies it, these are the folks who work through the winter holidays and the new year to get you home. Isaiah Rollolazo makes things happen. A passenger-service agent, he’s also known as a “red coat” in reference to the deep-red jacket he wears. At Seattle-Tacoma International Airport, the red coat indicates Rollolazo’s role on Delta Air Lines’ customer-service team. And sure enough, when I wonder aloud if I could do our planned photo shoot on an airplane to capture Porter and flight attendant Jollene Phelps in their natural work setting, Rollolazo launches into action. “I mean, I just gotta make some phone calls,” he says with a smile, then disappears. When he returns a few minutes later, four bright-orange safety vests — and a plan. As a red coat, Rollolazo is in charge of the terminals during the day. He assists with operations, ensuring flights are on time and providing extra help at the gates. He is also the first to respond if there are any passenger conflicts. Rollolazo will be working over the holidays this year, and he says that there’s a lot more pressure due to the increase in passengers (about 500,000 people will travel with Delta through Seattle) — especially those who aren’t regular travelers. 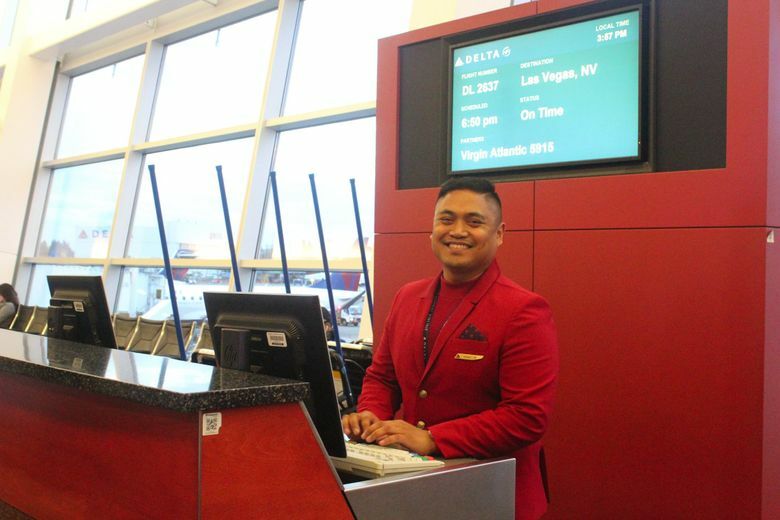 While the red coats handle issues at the gates, customer-service employees like Jeffrey Molina, who is part of the 13-person Pathfinder team at Sea-Tac, make sure passengers make it to the gates in the first place. “Our main goal is to help those people get to where they need to go and get through the checkpoints faster,” he says. With the holidays bringing more once-a-year travelers than usual, Pathfinders have their work cut out for them as they assist lost or confused passengers, keep walkways clear and monitor security-line wait times, helping passengers prepare and requesting additional services to make them move faster. But Molina, who joined the Pathfinder program a few short years after it was founded in 2000, is well-practiced in handling the holiday bustle. “I’ve been here 13 years, and I can tell who needs help, who has questions, who looks lost,” he says. Customer-service workers like the red coats and the Pathfinders may be among the most visible at the airport, but many people behind the scenes share in the job of keeping passengers safe, planes operating smoothly and toilet-paper rolls full. When you walk into the Airport Communications Center (ACC) at Sea-Tac, it’s like walking onto the set of a spy movie. Dozens of screens cover most of the walls and the three senior operations controllers at their desks don’t look up from their computers when we enter. In the ACC, the operations controllers have eyes on everything. They monitor secure-access doors throughout the airport, they schedule aircraft access to non-airline-owned gates, and they even receive and alert the appropriate response teams for calls about maintenance, janitorial, medical or security issues. “We get the plugged-toilet calls. We get the overflowing-toilet calls. We get anything in the airport that needs emergent response,” says ACC manager David Richardson. For general maintenance needs, C&W Services, the janitorial-services company that won a contract at Sea-Tac in 2017, keeps the airport clean. The company has introduced robotic scrubbers to clean the floors and an app that notifies the maintenance team by text whenever bathroom tissue or toilet-seat covers run out. 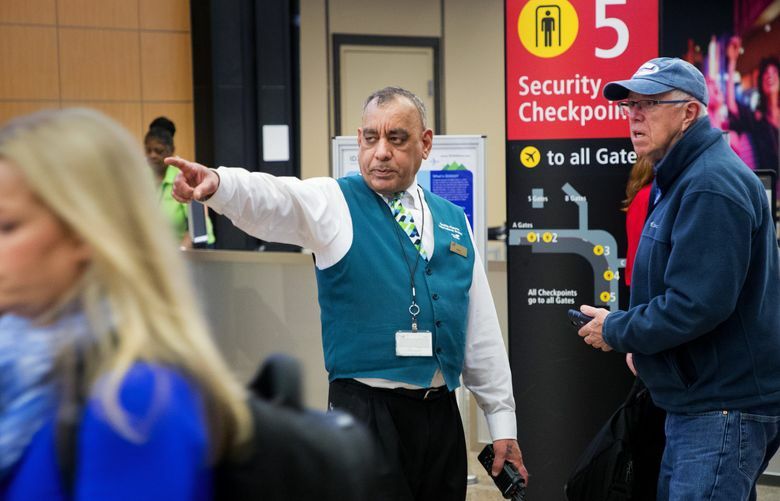 From the moment a passenger steps into the airport, their comfort and safety is in the hands of many of these behind-the-scenes staffers, working everywhere from janitorial services to customer service to security dispatch. In the meantime, aircraft technicians are making sure the plane is safe and the bags passengers check at the ticketing counter are making a journey through baggage services. You’ve probably noticed when traveling that the plane you board often arrives at the gate carrying passengers from a previous trip. What you may not have noticed is the team of aircraft technicians hustling to perform maintenance checks on the plane, speak with the previous crew and address any maintenance issues that may have come up with equipment during the flight. That equipment includes everything from navigation systems and engines to the onboard coffee makers. “They’re constantly calling about the coffee makers,” says Bill Serantoni, who’s worked as an aircraft technician for 37 years. If there are issues that require more time-consuming fixes, the plane may be taken out of service, moved to a hangar for maintenance and a new plane swapped in. But for most flights, technicians are in and out in under an hour. For Serantoni, who off-the-clock is an avid climber, the challenge of being thorough and on time is part of the reward. 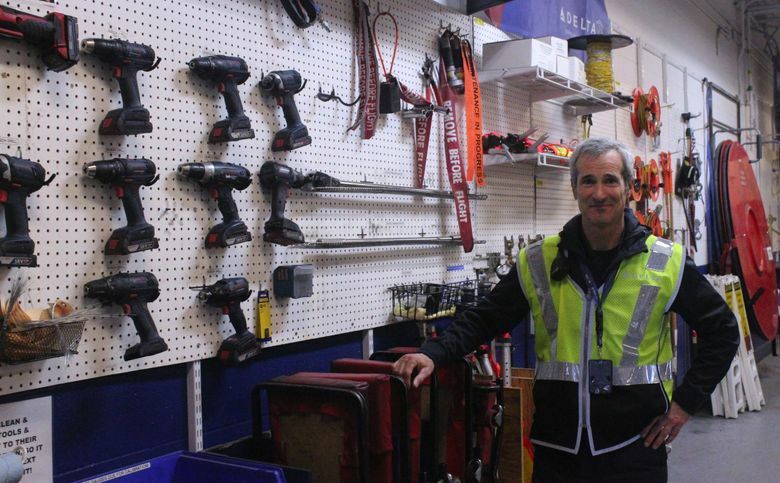 As technicians like Serantoni ensure your plane is in good shape, people like Angie Schmitke are hustling to get your stuff to the right place. Schmitke knows just how much of an impact baggage services has on a passenger’s experience. “You can have the greatest experience and at the end of your trip if that bag didn’t show up with you, everything that you just went through that was wonderful goes from ‘Wow’ to ‘Bleh,’” Schmitke says. Still, sometimes bags get lost — or as Schmitzke maintains, delayed. “Bags are never lost, they’re just delayed. They’re somewhere, somebody knows where they are, they’re just delayed,” says Schmitke, pointing out that there are over 9 miles of conveyor belt in the Sea-Tac baggage system. “There’s a lot of places that your bags can go. Not all of them are intertwined, but it’s easy to make errors. It’s easy to read a tag wrong,” she says. For Schmitke, even with the increase in baggage, the holidays are just “a short little blip” in the year. “It seems crazier upstairs,” she says. Her holiday travel advice? Be patient. 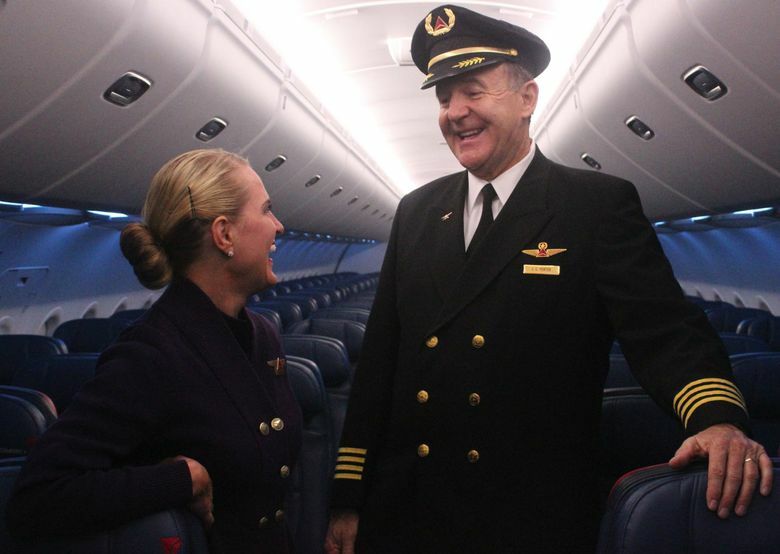 For Delta flight attendant Jollene Phelps, a fascination with airplanes is what drew her to the industry. Sometimes, that lifestyle means working over holidays, bringing passengers to their loved ones while missing time with their own families. Phelps, Rollolazo, Molina and Serantoni will all be working over Christmas this year. At the time of this writing, Porter had plans to spend Christmas Day with his wife, but would fly out again the next day, missing New Year’s and his 39th wedding anniversary. “It’s 24/7 365” is a phrase I heard from several airport and airline employees, referring to the unconventional hours their jobs require. But it’s not all work and no gingerbread for everyone working at the airport or in the air during the holidays. Rollolazo, a self-described “foodie,” said he planned to celebrate at a company potluck at the airport. “We’re really diverse here in Delta so we’ll try to bring a dish from all cultures. Like for me, I’m Filipino, I try to do lumpia, which is really popular,” he says. Porter, who’s worked his fair share of holidays in the 30 years he’s been a pilot, says that hotels where flight crew stay for layovers often provide a dinner spread for airline employees who are working over the holidays. But these can be sparsely attended, so he usually just celebrates early. “In the airline business, you know, some families have Christmas on the 25th; ours is on the 22nd. You just pretend,” says Porter. In the ACC hub, there’s even a brightly lit Christmas tree competing with the light from the security screens.